Paul Arizin’s path to basketball stardom began inauspiciously, if not down right ignominiously. A native of Philadelphia, Arizin tried out only once for his high school basketball team – during his senior year – but failed to make it. Enrolling at Villanova University as a chemistry major, Arizin continued to play basketball in various intramural, Catholic and independent leagues. Scouting the local talent, Villanova’s head coach, Al Severance, spotted Arizin during one of the games and offered him a chance to go to Villanova. Arizin politely informed Coach Severance he already attended the school and so the next year as a sophomore, Arizin joined the basketball team. Arizin rapidly progressed to become the nation’s best college player. As a junior he leveled 85 points in a single game. He even topped the 100 point mark in a single game, but the feat isn’t recognized because it came against a junior college. Nevertheless, his scoring average escalated from 11 to 22 to 25 by his senior year when he was declared Player of the Year and selected to the AP All-America 1st Team in 1950. Arizin’s success was attributable in large part to his unstoppable offensive weapon, the jump shot. So dependable was his jumper that Arizin is sometimes mistakenly referred to as the creator, the originator, or the popularizer of the jump shot. Not the case, but he was indeed one of its early users. During his pre-Villanova days, Paul claimed that his intramural games would be played in dance halls with slick floors. The popular shot of the day for a player in motion, aside from layups, was the hook. However, the slick floors prevented Arizin from firmly planting a foot to balance the hook. Already possessing a good one-handed set-shot and unconscionable hang-time, Arizin figured that jumping and firing the one-handed shot was his best option to take advantage of defenses and the slick floors. Another side effect of the dance hall scene was that Arizin’s shot had an incredibly low trajectory thanks to the low ceilings of the venues. He’d weave through defenders, dribble past his man, slink between crevices and rise up for his jumper which for the rest of his life retained a drifting nature. A vestigial effect of playing on those slick floors. Jumper aside, Arizin was also adept at diving down the lane, all the way to hoop, where he had some pretty good hang-time for silly layups that still went in. Leaving behind the dance halls and Villanova, Arizin joined the NBA in 1950. Playing alongside star forward Joe Fulks, Arizin’s rookie season was the least impressive of his career. He averaged a very respectable 17 points a game and proved a tenacious rebounder with 9.8 boards per contest. The next season, 1951-52, Arizin broke out as the Warriors’ best player as Fulks began to age and battle alcoholism. Not only was it Arizin’s breakout season, it may have been his finest ever. His scoring average of 25.4 led the NBA and he paced all shooters with a field goal percentage of .448. Paul also proved to be the league’s most durable workhorse by playing in all 66 games and led the NBA with 44.5 minutes played per game. 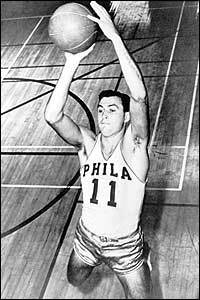 It used to be: stop Joe Fulks, and you stop the Philadelphia Warriors. Not so any more. Not while a gent named Paul Arizin is around. Arizin, a tireless, six-foot-four Jumping Jack , currently is the big gun in Philadelphia’s attack the Warriors have played three games so far and Arizin has been a high scorer each time, netting, in order, 22, 23 and 29 points. Making his second straight All-Star game in 1952, Arizin would take home the MVP award for that game after scoring 26 points on a scintillating 9-13 shooting from the field and 8-8 from the free throw line. Arizin would also be selected to his first All-NBA 1st Team. The Warriors finished 33-33 and were ousted in the Eastern first round, 2-games-to-1, by Syracuse. The NBA did not hand out MVPs yet, but by my estimation, Arizin is the best choice for that designation in the 1951-52 season. Arizin had clearly arrived as one of the NBA’s top acts. This was not solely due to his amazing jump shot. That was but one weapon in his arsenal. Helping him further was an innocuous breathing condition that caused him to wheeze loudly. The heavy breathing could take opponents off guard, something they could ill-afford with Arizin. Wheezing aside, Arizin also had just a way of deceptively jabbing his feet and shaking his shoulders to throw defenders further off guard – you’ll see what I mean by watching the video at the end of this article. If left wide open, he would take a one-handed set shot. If a defender closed out hard, he would counter by dribbling hard himself and close in on the basket. Sometimes he would pull up for the jump shot. (In fact, he never took a jump shot while standing still. It was always off the dribble.) Other times, he progressed all the way to the basket for a winding layup utilizing his spectacular jumping ability or was hammered hard by defenders and would go to the free throw line. For his career, he nearly averaged as many FTs made (7.0) as FGs made (7.9) per game. Arizin’s perch atop the NBA was short-lived, though, as he was spirited away by the United States Marine Corps. With the Korean War still raging, the draft was in full effect and Arizin got his call prior to the 1952-53 season. He would spend the next two years on the Marine base in Quantico, Virginia, as a bookkeeper. In his absence, Joe Fulks retired and Neil Johnston surged to the forefront as the Warriors and the NBA’s leading scorer. But without a helping mate, Johnston’s Warriors floundered to a 12-win and then a 29-win season. Finally, Arizin returned for the 1954-55 campaign and a dynamite duo was created. Working his way back into NBA shape, Arizin posted a respectable season as a the Warriors improved to a 33-39 record. The following season, Arizin, Johnston and their band of Warriors boasting Tom Gola, Joe Graboski, and Jack George stormed their way to an NBA best 45-27 record. Arizin rose to the occasion in the postseason and averaged 29 points per game in the playoffs. In Game 5 of their Eastern Division Finals contest against Syracuse, Arizin logged 35 points in the 109 – 104 victory. Since the series was a best-of-five, it’s a good thing Arizin scorched the court that night. The Fort Wayne Pistons’ biggest problem appears to be stopping Paul Arizin as they try to square their [NBA] championship series with Philadelphia here tonight. Arizin has scored 82 points in three games and the Warriors hold a 2-1 edge in the best of seven series. They won two four-point victories at Philadelphia and the Pistons won by a single point here. Fort Wayne may have to put two men on Arzin to keep the home floor hex working. Philadelphia hasn’t won a game here in four years but almost made it Sunday. The Warriors were perhaps on the cusp of a mini-dynasty, but bad luck and the military draft happened. 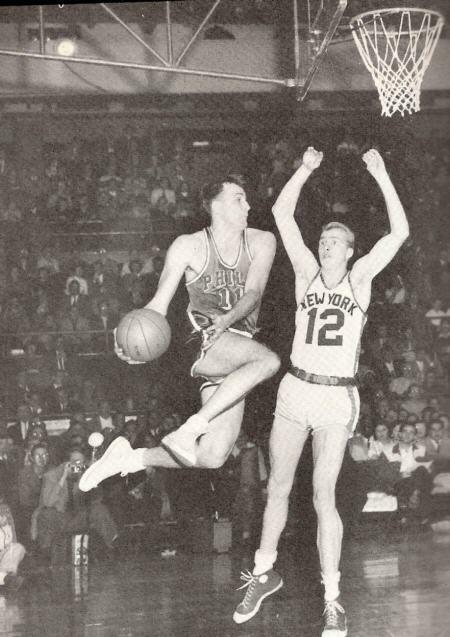 Between Tom Gola serving in the armed forces in 1957 and Neil Johnston’ career-ending injury in 1959, the Warriors were never quite able to fulfill their promise, suffering a first-round sweep in 1957, a 5-game smack down by Boston in the 1958 Eastern Finals and missing the playoffs entirely in 1959. Through it all Arizin, was the one constant for Philadelphia. He again led the league in scoring with 25.7 points per game in 1957 and averaged a career high 26.4 in the 1959 season. He made two more All-NBA 1st Team appearances in 1956 and 1957 followed by a 2nd Team selection in 1959 and was an All-Star every one of these seasons. Indeed, he made the all-star game in every year of his career. The 1959-60 season saw the Warriors surge back to relevance behind the sensational rookie season of Wilt Chamberlain. His 37.6 points and 27 rebounds were clearly the talk of the town, but Arizin remained steady with averages of 22 points and 8.5 rebounds for the season. With Tom Gola (15 PPG, 10.5 RPG, 5.5 APG) back in the fold and new addition Guy Rodgers (11.6 PPG, 7 APG, 6 RPG), the Warriors appeared a legitimate challenge to defending champion Boston, but fell in six games in the Eastern Finals that year. 10 year veteran Paul Arizin fired in 43 points in 41 minutes last night to power the Philadelphia Warriors to a 110-103 victory over the Syracuse Nationals in the opener of the best of five Eastern Division National Basketball Association playoff. Arizin sank 16 field goals in 28 shots, 11 of 15 free throws and corralled 10 rebounds to his season high and turn in one of the finest performances in 10 years with the Warriors. With Pitchin’ Paul’s hot start Philadelphia survived in 5 games to face Boston in the Eastern Finals. The series was a back-and-forth struggle in which the home team won every game. Bad news for Philly since Boston had the home court advantage. Losing by 2 points in Game 7, the Warriors decamped from Philadelphia to San Francisco, and Arizin retired from the NBA to stay near his Philly home. Taking a better-paying job at IBM, Arizin continued playing pro ball moonlighting for the Camden Bullets in the Eastern Basketball League for three more years. Arizin led the club to the 1964 EBL title and was also named MVP of the league in 1963. Just a couple more feathers to put in Arizin’s illustrious cap. When Arizin left the NBA he was the league’s third all-time leading scorer with 16,266 points. He was the first player to string together nine straight 20+ PPG seasons. At 6’4″ he’s also the shortest player in league history to average at least eight rebounds a game for his career. If he had not missed two seasons due to the military, he very well could have been the first player to top 20,000 career points. Arizin got a pretty good haul for a man who was cut from his high school team and even after his All-America days at Villanova thought he had no future in professional basketball.